Just one day before another general strike against austerity measures there where 3 attacks with molotov cokcktails in Athens, Greece. Image: Archive photo from molotov attack against riot cops of the MAT at Polytech university, Athens, Greece. Last night a MAT squat was attacked again at Polytech. According to Athens Indymedia the first attack was carried out at 02:35am. A group of about 20 people attacked the Omonia police station with molotov cocktails. Shortly after the first attack, a building of the chamber of commerce was attacked at Caniggo square. At 02:45 a squad of the MAT riot cops was attacked at the Tositsa and Pattision junction (Polytech university). The attacks came just one day before a general strike against another round of austerity measures in Greece. One of the austerity measures is a 19% pensions cut. In the last years the Troika of EU and IMF already enforced severe pension cuts. Anarchists are mobilising for tomorrows general strike as well (Image below). 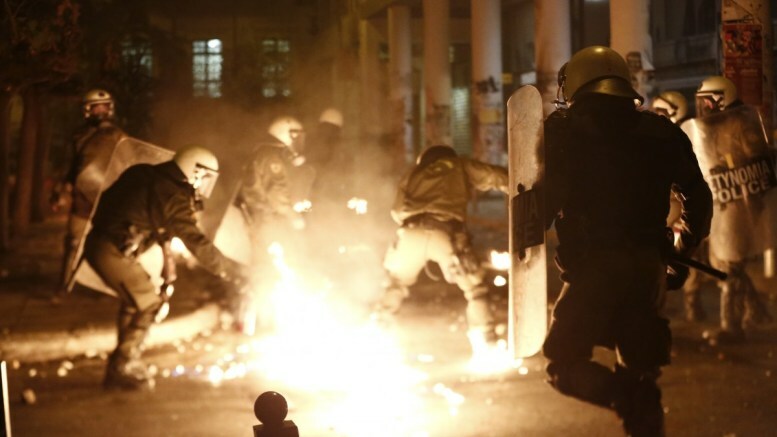 #Athens #Greece: Clashes During General Strike | Enough is Enough! Clashes in Athens & Thessaloniki As Parliament Votes For More Austerity | Enough is Enough! #Athens #Greece: Clashes During General Strike – Enough is Enough!